The answer is that while the Fed is technically tightening, other Central Banks, particularly the Bank of Japan (BoJ) and European Central Bank (ECB) have been printing their currencies by the hundreds of billions. 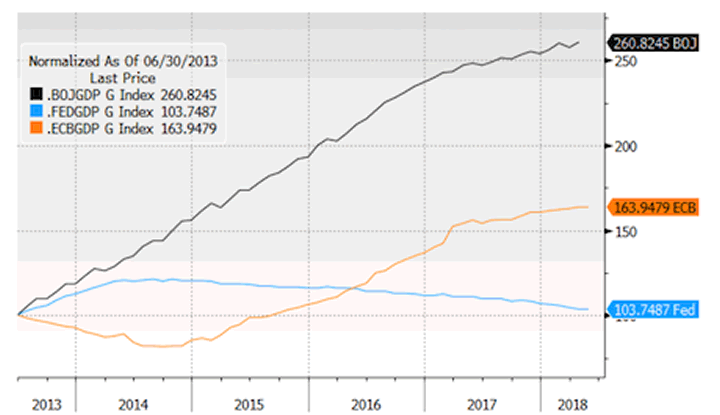 See for yourself… below is a chart showing the balance sheets for the Fed (blue line) the ECB (orange line) and the BoJ (black line) since 2Q13. First and foremost, while the Fed is technically shrinking its balance sheet, the amount it has shrunk is negligible. Since the second quarter of 2013, the Fed’s balance sheet is still UP 3%. Over the same time period, the ECB grew its balance sheet by 63%. And the BoJ has grown its balance sheet by an astonishing 260%. Mind you, throughout much of this time period, especially post 2016, NONE of these economies were shrinking. So these Central Banks were pumping all this money into GROWING economies! This is what has unleashed inflation. And smart investors are already taking steps to profit from it.